For this year’s gift guides, we’ve teamed up with some of our favorite bloggers (The Chirping Moms, Stroller in the City, Our Family Lifestyle, Divine Lifestyle, and Momtrends) for a collaborative gift guide series. We’re each covering our gifting “area of expertise” and therefore we’ll be able to share gifts for all different ages (from babies to teens and adults!). 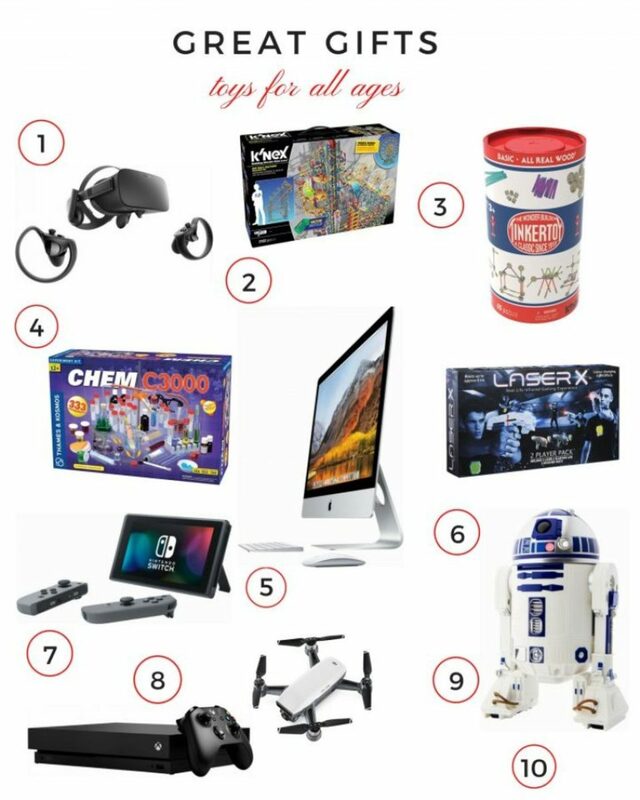 This Gift Guide: Toys for all Ages features some of our top picks of toys that really work for all ages. We also call these family gifts. Surround yourself with all the action with this Oculus Rift VR gaming bundle. The comfortable headset features adjustable straps and balanced weight so you can game or watch your favorite movies for hours on end. The Oculus - Rift + Touch Virtual Reality Headset Bundle includes touch controllers with this Oculus Rift VR gaming bundle are ergonomically designed for easy and immersive interaction. This K’NEX Thrill Rides Big Ball Factory Building Set has returned after 20 years in the K’NEX vault. This battery-powered machine has 3,152 colorful pieces and includes a motorized chain lift and two coaster cars, providing endless building possibilities. This set helps teach STEAM (science, technology, engineering, arts, and math) principles while building on children’s natural curiosity and creativity, and empowering a fun playing environment. K’NEX also supports key areas of children’s developmental growth. Clicking the different parts together and discovering how the building system works strengthens children’s hand-eye coordination, fine motor skills, problem-solving skills, spatial awareness, and imagination. This Tinkertoy Basic Building Kit will bring back memories from your childhood! this set includes 65 real wood Tinkertoy parts and pieces including rods, spools and end caps. Tinkertoy is great for builders ages 3 and up. Get started creating with the 9 including building ideas, or build anything you can imagine with the included parts and pieces. Once building time is over, use the iconic tube storage container to keep all the pieces together. The Thames & Kosmos CHEM C3000 is the chemistry set to beat all chemistry sets. This kit includes all of the components from CHEM C2000, plus dozens of additional tools and chemicals, and 100 additional experiments, for a total of more than 333 experiments. The 192-page, full-color experiment manual is written at a more advanced level than the other CHEM kit manuals. CHEM C3000 has a similar hands-on approach to teaching chemistry as their other CHEM kits, but also teaches more advanced topics such as chemical equations, atomic structures, and the periodic table. This Apple 27" iMac could easily become the hub of your household. iMac performance is at an all time high with faster Intel Core processors, powerful Radeon Pro 500-series graphics, Thunderbolt 3 (USB-C) connectivity, and stunning Retina 5K displays that shine 43 percent brighter and support one billion colors. The LaserX, interactive game system with Long Range Blaster gets the entire family off the couch for a fun game of laser tag with this updated, technologically-advanced laser blaster system. All-new Laser X features sophisticated electronics and optics that give players pinpoint blasting accuracy up to 200 feet. Laser X sets work together, so games can have as few as two players – or the whole neighborhood can play together. Laser X can be played outside in bright sunlight or in the dark. The Nintendo Switch is the hottest thing to hit Christmas wish lists in years! Everyone wants one! We LOVE our Nintendo Switch portable game console! In addition to providing single and multiplayer thrills at home, the Nintendo Switch system can be taken on the go so players can enjoy a full home console experience anytime, anywhere. The main unit rests in the Nintendo Switch dock at home, which connects the system to the TV. Grab your Switch from the dock for on-the-go gaming. Share Joy-Con so players can go head-to-head while away from home. Enjoy the same games in tabletop mode by using the included stand to prop the system up. These sleek black Xbox One X console just plays your games better. 40% more power than any other console allowing you to experience immersive true 4K gaming. Blockbuster titles look great, run smoothly, and load quickly even on a 1080p screen. Xbox One X also works with all your Xbox One games and accessories as well as Xbox Live, an extremely advanced multiplayer network, giving you more ways to play. The DJI Spark Portable Mini Quadcopter Drone features all of DJI&apos;s signature technologies, allowing you to seize the moment whenever you feel inspired. With intelligent flight control options, a mechanical gimbal, and a camera with incredible image quality, Spark empowers you to push your creative boundaries. This Sphero - R2-D2 App-Enabled Droid will delight the Star Wars fan in your family. Made to resemble the iconic Star Wars character, this fun robot features authentic LEDs for realism and a motion sensor that detects your presence and reacts. An integrated speaker on this Sphero R2-D2 app-enabled droid lets him &apos;boop&apos; and &apos;beep&apos; in his own special language. We hope that you love our Gift Guide: Toys for all Ages.